Saket Modi was always interested in knowing how technologies are created and how they can be broken. “For me, cybersecurity was a by-product of the cyber age, which I was deeply interested in. This is what showed me that there is a universe of vulnerabilities out there,” he said. However, when he decided to set up Lucideus, offering enterprises security solutions was far from his mind. Modi recalls that the genesis of the company began during his time as an engineering student when he offered training and workshops at premier institutions around the country such as the IITs. “A few hundred students would turn out for these Rs 1,000-priced, two-day workshops which had 8-hour sessions daily,” he explained. This was also when he met his to-be co-founder Vidit Baxi, who also offered similar training sessions at different institutions. As both had identical aims regarding their careers, the duo decided to establish Lucideus in 2012. They were soon joined by a third co-founder Rahul Tyagi. “Baxi and Tyagi were both very interested in joining me as co-founders,” a beaming Modi said, showing off the old messages on his phone. Lucideus Technologies provides security solutions to enterprises. The firm was incubated at IIT Bombay in 2012 and between 2013 and 2014, it began offering its solutions to small and medium enterprises. “By 2015, we already had over 100 customers for our enterprise customer service team and we had slowly started eyeing larger organisations,” Modi explained. However, at the time of its inception, Lucideus was faced with a tricky challenge—a shortage of skilled and trained cybersecurity professionals in India. To overcome this, Modi and his team started a training school as part of the company and re-absorbed the trainees into Lucideus as employees once they graduated the course. “We have trained hundreds of professionals in cybersecurity since then and it continues to be a third source of revenue for the company, contributing to about 9% of the total turnover,” Modi said, adding that he still sees a shortage of professionals. “We still have 85 openings right now,” he said. As part of the training, Modi and his team asked potential hires to get certified for the training programme by taking the Offensive Security Certified Professional (OSCP) tests. “As soon as they had graduated, we told our employees and students to take the test within the next six months. If they failed to pass the test as employees, they were told to leave,” he said. Since then, Lucideus has grown not only in terms of its offerings but also expanded its operations overseas. Lucideus, which has over 160 customers in 14 countries including the US, Hong Kong, Singapore and the UK, runs three entities—Lucideus Tech Pvt. Ltd, Lucideus Technologies and Lucideus Inc. (based in the US). Some of its customers include the National Payments Corporation of India (NPCI), ICICI Bank, HDFC Bank, Kotak Mahindra Bank, DBS Bank, DCB Bank, Khaitan & Co, ITC Group, L&T Group, Adani Group, Motilal Oswal, Future Generali, KFC, Pizza Hut, Shopclues, Quikr, Tata Sky, SRL Diagnostics, Amdocs, Capgemini, S R Dinodia, NSDL, Bajaj Finserv, UTI Mutual Fund, SpiceJet, Indigo, Mumbai and Delhi airports and SoftBank. Currently, the company offers two main solutions Security Assessment Framework for Enterprise (SAFE) and enterprise security services. While SAFE, according to Modi, has now become the primary source of revenue, the company’s enterprise customer service (ECS) team continues to grow its gamut of security solutions. “We introduced SAFE in 2017 and now it contributes to over 50% of our revenue,” Modi. The solution provides a score-based rating of the cybersecurity infrastructure of a company using machine learning and artificial intelligence. Modi said that the company also runs an advanced threat intelligence lab from its Delhi office. The lab collects data to expand the knowledge base and enhance accuracy for its machine learning capabilities. Lucideus also operates such labs in Palo Alto, Boston, Bengaluru and Mumbai. Besides this, the company has a research and development team of six people who develop more features for SAFE. According to Modi, all the three companies were growing at a cumulative rate of 300% on a yearly basis since inception. However, for the financial year ended March 2018, Lucideus Tech Pvt. Ltd reported revenue of just Rs 3.33 crore, a little or no change from the previous year, which was Rs 3.42 crore, according to data from VCCEdge, the research arm of News Corp VCCircle. For 2017-16, the company reported revenue of Rs 3.99 crore, which was a huge increase from revenue reported in 2014-15, which stood at Rs 1.23 crore. For the period ending March 2014, the company had reported a revenue of Rs 26 lakh. Lucideus Technologies, which shows no revenue in 2017, according to VCCEdge, reported a total turnover of Rs 7 crore for the period ended March 2018. As it grew, the venture attracted investments from marquee investors. In 2017, the company had raised an undisclosed amount from angel investors such as Amit Ranjan, chief architect of Digilocker, an initiative launched by the Indian government; Anurag Goel, CEO of Cactus Communication; Govind Rajan, former CEO of Freecharge; Jonathan Boutelle, a former director of technology at LinkedIn/SlideShare; Rajan Anandan, managing director at Google India; Rahul Chawla, managing director and head of global markets at Deutsche Bank; Kulmeet Bawa, former managing director of Adobe India and Salil Donde, a former executive vice president at NASDAQ. Other angel investors include Anand Chandrasekaran, former product head at e-tailer Snapdeal; Amit Chowdhary, director at Motilal Oswal Private Equity; and Sanjay Baweja, chief financial officer at renewable power solutions firm Suzlon Energy; Pratyush Kumar, president at aerospace major Boeing; and Mickey Doshi, CEO at Swiss financial major Credit Suisse. 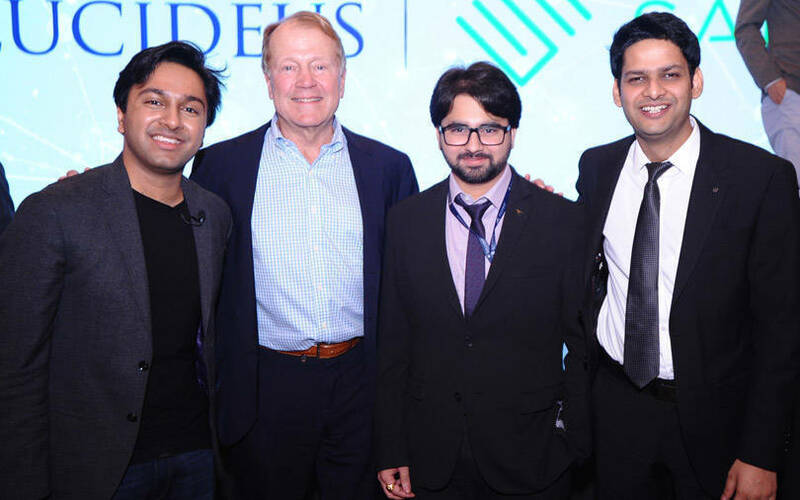 In October 2018, Lucideus stole the spotlight when it received $5 million (Rs 36 crore) from JC2 Ventures, the venture firm of former Cisco executive chairman John T Chambers. According to Modi, Lucideus’ success is largely due to its ability to acquire marquee customers from each industry segment and is now looking to expand its operations globally. “We want to replicate our win strategy at home. We have acquired marquee customers in each segment by focusing on them and we will continue to drive this at home,” he said. He further said that he was looking at the US as one of the top markets globally alongside Europe and Southeast Asia, especially with Chambers’ backing. “We want to reach a position where India will contribute to just 11% of the company’s revenue,” he said, adding that Lucideus was a channel-strategy driven company and was partnering with large system integrators to push its solutions.